Limas above. 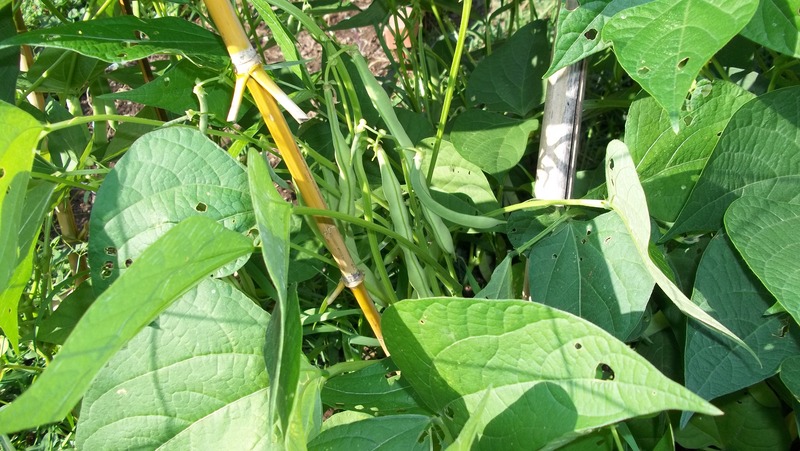 Limas and green beans below, learning to go “over” instead of “up” , crawling on a wire between two 9′ trellises. 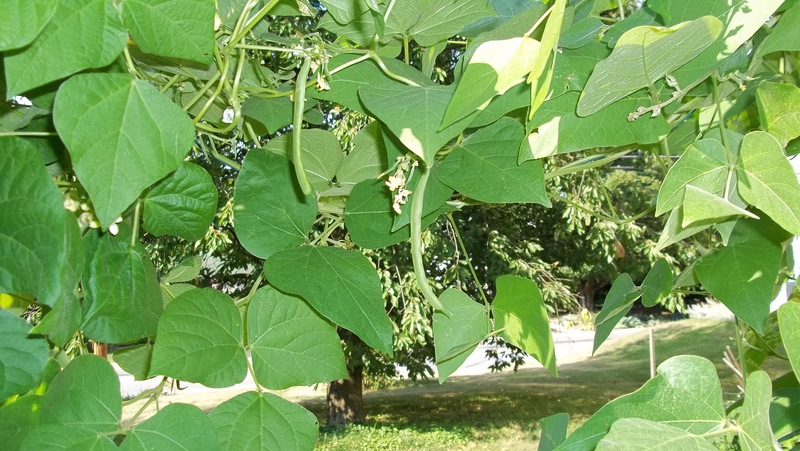 Jack in the Beanstalk is a nice story and all that, but I’m not really wanting to climb up on a ladder to pick beans. There’s even a possibility that I’m even too old for that stuff, lol. Kidney beans below, which I never grew before. I think I feel a need for chili in a couple weeks. Did you know that red kidney beans must be cooked at least 10 minutes (and never eaten raw) because they actually contain a toxin that will be removed by boiling them for 10 minutes? The canned ones are ok, since the canning process of cooking removes the toxin. If you use the dried ones, you should boil them for 10 minutes before you put them into your recipe, to be sure they’re cooked well enough. I’ll eat some of these fresh, (cos I only have a couple plants), by boiling them 10 minutes, then put them into chili, etc. 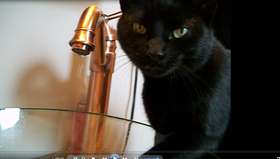 Then I’ll dry the rest to use later. Seeds; I always think of seeds and the process of saving seeds as being natural, an old practice, and vitally important. 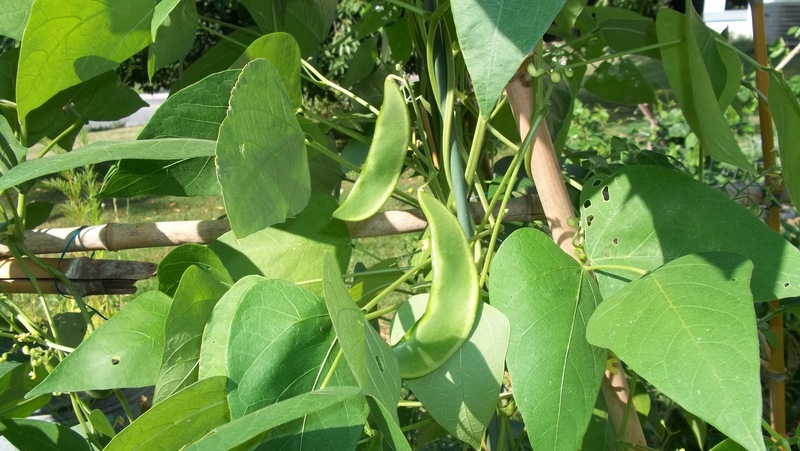 The beans inside the bean pods are beans now, but will be seeds if we let them dry. I will let some of all of these and the black eyes dry, and use some for soup in the winter, and some to plant next spring. You can’t do that with GMO seeds; you need the real, natural thing to ask nature to give you more good stuff next year. 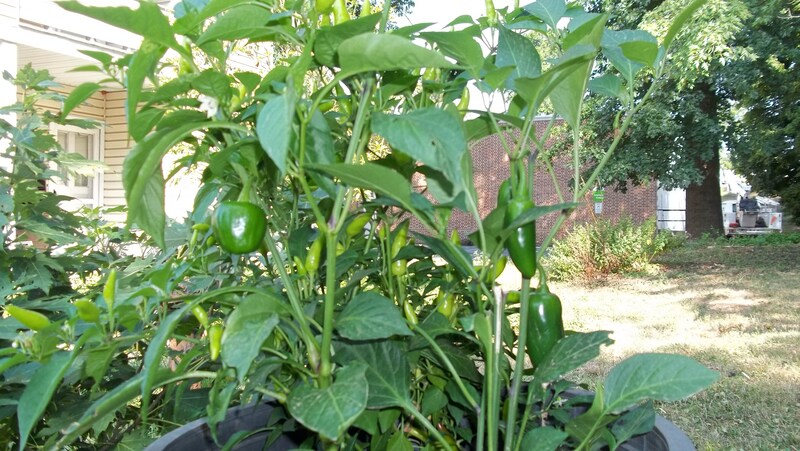 Might as well throw in a picture of some peppers too, one of which is super chilies and one jalapeno. The hot peppers can be dried by laying them on a sunny window sash (away from the cat….. 🙂 ) on a paper towel and just let them lay there for maybe a month. Turn each one over a couple times. Make sure they’re really dry and crackly before you pack then in an air tight jar, or mold will ruin the whole batch quickly. In the winter, add them to soups or tomato-y recipes and they’ll light up your winter evening. And, in drying and packing them away, remember to reserve some for seeds for next year! Tomorrow is the old holiday of Lammas, the beginning of the harvest. In the old times it signaled the beginning of the harvest of fruits and some grains, preparing for the long cold winter. Grow on now, and have good harvests of whatever you’re growing, I hope! You’re welcome Jackie. Maybe just part of one chili in your soup………then you can enjoy the kick without causing yourself a problem. Have a good weekend! Thanks! I’m enjoying every bite. I had no idea when I harvested my edamame this morning that tomorrow was Lammas! I love how gardening always seems to turn its’ wheel right along with events on the calendar. That interconnection of life fascinates me. Anyway, here’s a picture: I got 4 lbs of pods from a tiny little plot in my backyard. And right on time for Lammas. Yea I don’t know if you can post a picture in reply, guess not. It all fascinates me too, and those older cultures knew things we’ll never get to understand. 4 lbs, that’s great! Will you freeze them or what?. Yes, blanch in salted water, then freeze.